WASHINGTON — “Pop-up” might have been the buzz word of 2014’s dining scene, but it’s not dying off just yet. In fact, these short-term food showcases are happening with increased frequency in the D.C. area. The temporary events, which can range anywhere from a single dinner to a multi-month business, offer diners the chance to experience a new cuisine or concept. And they offer chefs, whether seasoned or green, the opportunity to exercise their culinary creativity or test out a new dish. The New Year is ushering in a whole new collection of food pop-ups in the D.C. area, and Laura Hayes, editor of Dining Bisnow, has a list of the ones that are not to miss. Known as one of the D.C.-area’s best in fine dining, Restaurant Eve is shaking things up in its Alexandria kitchen throughout the month of January with a Filipino pop-up menu. “They’ve stepped far out of their typical comfort zone to cook a Filipino feast,” Hayes says. Chef Cathal Armstrong is a native Dubliner, but his wife has roots in the Philippines, Hayes explains. So it was his wife’s family history, combined with a recent trip to Thailand that inspired the new venture. It’s not surprising then that the menu, offered throughout the month of January for $60 a person, features dishes from both the Philippines and Thailand. Hayes says the highlights on the menu include a Thai seafood curry and Armstrong’s take on Filipino barbecue. “[Armstrong] uses an excellent slab of pork belly that he serves alongside rice with an egg on top. That kind of fuses several different elements of Filipino cuisine, while still staying true to Restaurant Eve’s commitment to using the best products out there from local farms,” she says. Eat Place is one of D.C.’s newest food incubators, only it operates more like a restaurant than a commercial kitchen space. Hayes explains that different pop-ups come through the space and host what is called a “residency.” And the newest resident at EatsPlace is the incubator’s founder Katy Chang. “She just has such fond memories of spending time with him in the kitchen, and says that he really taught her about food and life, and so Katy really is pouring her heart into these dishes,” Hayes says. Baba’s Dumplings is open in January from 5 to 10 p.m. Tuesday through Thursday, 5 to 11 p.m. Friday, 11 a.m. to 11 p.m. Saturday and 11 a.m. to 10 p.m. Sunday. Chef Tim Ma is experimenting with a longer-term lunchtime pop-up at his Arlington restaurant Water & Wall. And Hayes says the best part about this pop-up, called Silk Road Noodle, is the variety. Another unique aspect of the Silk Road Noodle pop-up is that Ma invites a guest chef each month for a featured dish on the menu. Jonah Kim, who is opening Yona with Mike Isabella in Ballston this year, is this month’s guest chef at the pop-up, and Hayes says his soba noodle and mushroom broth soup is a must. “I understand it took a lot of work to get the flavor in there. I believe he sous-vided the mushrooms, vacuum-packed them and really got a lot of mushroom flavor in there,” says Hayes, who adds that the soup is also served with a short rib meatball and a Japanese-style tempura. Experienced bakers Tom Wellings and Camila Arango are testing out their forthcoming bakery on Jan. 25 at After Peacock Room in Georgetown. At the one-day event, which will begin at 7:30 a.m., the husband-and-wife team will preview all of the goodies they plan to have at their boulangerie-style bakery, planned for Shaw. At Shaw’s fast-casual seafood restaurant Fishnet, chef and owner Ferhat Yalcin is hosting a pop-up to show off his fine-dining skills. Hayes says on Monday and Tuesday nights, Yalcin sets out four placemats in his kitchen for a dinner far different than the ones on his typical menu. “From there you can watch him cook a six-course seafood dinner, and he’s calling his popup Fishnook,” Hayes says. The meal is $55 a person and reservations can be made by email. So far, there is no end date for this pop-up, and Hayes predicts it won’t come to a close any time soon. Located just behind Union Market in Northeast D.C. is Dolcezza Gelato Factory, which is becoming a real hub for the city’s pop-ups. “And I can see why; it’s a remarkable place to hold a dinner, and that’s exactly what chefs are looking for when they’re looking for a space,” Hayes says. Quite a bit of activity is happening at the factory this month. 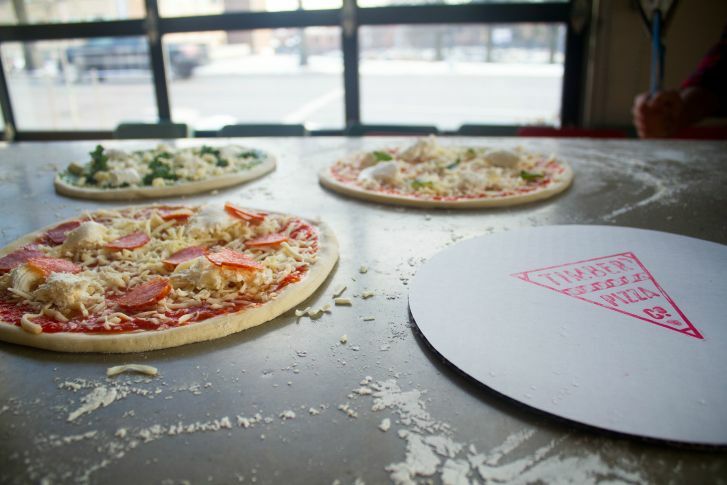 On Jan. 30, Timber Pizza Co., a mobile wood-fired pizza operation that often parks at farmers markets and breweries, is holding its first pop-up in the space. Hayes says the guys behind Timber are hoping to open a brick-and-mortar restaurant in the near future, and they want to give Washingtonians a taste of what’s to come. “It will be a five-course dinner full of pizza, no doubt. But it will be paired with some really great craft beers,” Hayes says. She says diners can also expect a great selection of cocktails, wines and beers from Rubba’s Neighborhood Restaurant Group co-workers. Follow WTOP and WTOP Living on Twitter and on the WTOP Facebook page.